Sammy and his three friends live in the Ardoyne, an impoverished, predominantly Catholic area of North Belfast that has become the epicentre of a country intent on cannibalising itself. They love sharp clothes, a good drink, and the songs of Perry Como – whose commitment to clean living holds up a dissonant mirror to their own attempts to rise above their circumstances. They dream of a Free State, and their methods for achieving this are uncompromising, even as they fully indulge in the spoils of war. Keen to make a difference, the boys find themselves in the incongruous position of running a comic-book shop taken over by the IRA. Their clandestine activities belong in the x-rated pages of graphic fiction: burglary, blackmail, extortion, torture, and murder – and they become transfixed by the initiatory possibilities of free-reign criminality. But when punk rock arrives and the hard edge of the decade starts to reveal its true paranoid colours, Sammy finds himself increasingly isolated, especially after bizarre and gruesome away days in Glasgow and London. Camaraderie and loyalty is the fuel of a terrorist cell. When those virtues prove faulty, the game is up – and Sammy’s world starts to shrink as he is assaulted by terrifying visions. For The Good Times shouts and sings with visionary depth and power. It is not just a book about the IRA, but an exploration of what it means to ‘go rogue’, of the heartbreak and devastation that commitment to ‘the cause’ can engender, of ideas of martyrdom, fatherhood, and self-sacrifice. It unpacks any dewy-eyed romance associated with the Troubles while re-visioning it as a time of psychological and spiritual intensity where the nature of day-to-day reality itself was up for grabs. 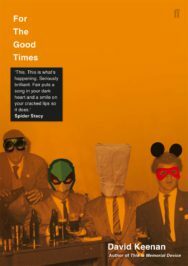 And through a dizzying amalgam of modernist prose, roughhouse vernacular and hallucinatory Irish humour, it establishes David Keenan as one of our most fearless literary stylists. David Keenan was born in Glasgow and grew up in Airdrie, in the west of Scotland, in the late-70s and early-1980s. He is the author two novels, the cult classic This Is Memorial Device (Faber & Faber), which won the Collyer Bristow/London Magazine Award for Debut Fiction 2018 and was shortlisted for the Gordon Burn Prize, and For The Good Times (Faber & Faber). 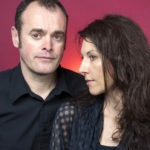 He is also the author of England’s Hidden Reverse (Strange Attractor Press), a history of the UK’s post-punk/Industrial underground, as well as To Run Wild In It (Rough Trade Books), an experimental novella, and the co-designer, alongside Sophy Hollington, of his own tarot pack, the Autonomic Tarot (Rough Trade Books).